The Bedford County Chamber of Commerce is pleased to announce the recent hiring of Sarah Ferrari as Program and Events Coordinator. Ferrari, a native of Bedford, comes to the Chamber from the Omni Bedford Springs Resort where she most recently worked as the catering sales manager. Sarah lived in Italy for five years where she studied Interior Design in Milan at the Scuola Politecnica di Design before returning to Bedford where she helped to open LIFeSTYLE, an Italian market and trattoria in downtown Bedford. Ferrari said the Chamber is a good fit because it encompasses all of her past lives. Ferrari said she’s looking forward to spearheading many of the Chamber’s existing events, like the signature Annual Dinner and Awards Celebration, and adding some new ideas. “I’m most excited about getting to know and working with all of the leaders in this community and using what we’re all best at to create wonderful events,” said Ferrari. Some of the events that Sarah will be working on include the Women in Business series, Olde Bedford Beer Festival, Golf Tournament, Foundation fundraisers and some new ideas that she will share soon. Sarah resides in Bedford Borough with her partner Valentina, and children Alex and Layla. Also, she recently adopted her family’s first dog, Trip. Feel free to stop by the Chamber office at 203 South Juliana Street to welcome Sarah to the team. 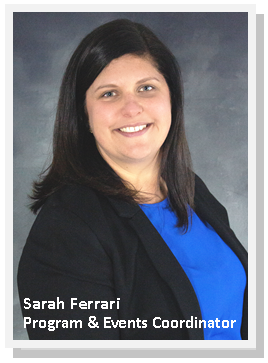 You can reach Sarah Ferrari by email: sarah@bedfordcountychamber.org.